Do you want your stallion to be seen by breeders? 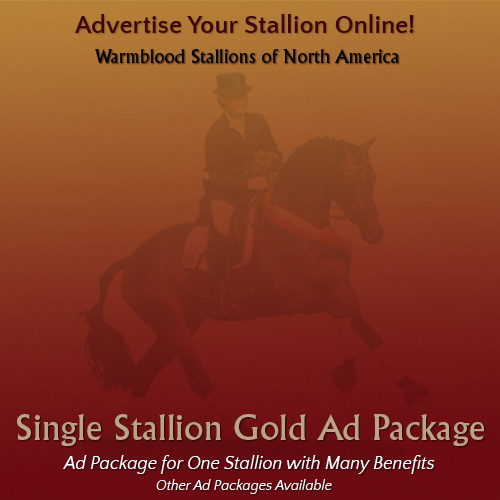 Warmblood Stallions of North America has created a new online network to put your stallion in front of breeders on three platforms: the new WarmbloodStallionsNA.com, the WarmbloodStallionsNA Facebook page, and the Warmblood Breeding email newsletter. The new WSNA ad packages give you all three, and are affordable, smart, and trackable. This ad package includes a Stallion Profile on WarmbloodStallionsNA.com - a detailed page for your stallion. Stallion Profiles make up the heart of the website, and bring breeders from all over North America. Another important piece of this ad package is active promotion. We work with you to post news about your stallion. It's like having a small ad agency! For all the benefits included in this package - or to see a comparison chart of the three package options for single stallions, click here. We also offer cost-effective packages for multiple stallions. Click here and look at Farm packages.